So, Roadburn 2019 has moved the pre-party from Cul de Sac — which was always packed — to the 013 proper, where it will be held in the Green Room for the first time. I’d expect that to fill up as well, as Temple Fang, Hellripper and one more band still to be announced take the stage to kick off the festival. 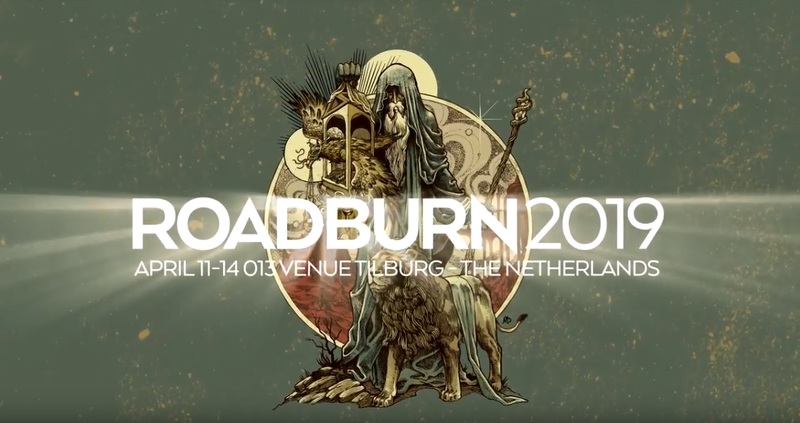 It’s just one more example of how Roadburn keeps getting bigger. Sunday used to be the Afterburner, with fewer stages. Now it’s a full-blown fest day. The pre-party used to be two bands, then three, now a new venue. Pretty soon Roadburn is just going to be a full week long and will take over the entire town of Tilburg each April. You won’t hear me complain when it happens. I’m thrilled to say I’ll be back in the Netherlands for Roadburn 2019 this April, once again serving as the editor of the Weirdo Canyon Dispatch daily ‘zine. I am honored and humbled to one again have the opportunity to be there and to do that work — I need to get an email out to the writing staff like yesterday, which is typical — as it’s a project I believe in deeply and an opportunity to work with a group of writers, photographers, graphic artists and others I deeply respect. Thank you to Walter and the 013 for having us back for another go. It’ll be fun. With each member initially only known by an initial, as though mere spectres channeling this labyrinthine music from some other galaxy, BOSSE-DE-NAGE have navigated the last decade expertly, creating five incredible records, of which last year’s Further Still is the culmination so far. Melding black metal, shoegaze, post rock and screamo, we’re prepared for a mind-melting experience when BOSSE-DE-NAGE take to the stage at Roadburn. Check out any STREET SECTS album artwork, and you’ll feel like you’ve plunged into the gritty, harsh world of a hardboiled crime novel, a genre famous for its unflinching realism and toughness. Adjectives that can well be applied to the music this duo from Austin, Texas creates, as well. Music is often described as escapism, but when Leo Ashline hollers, shrieks and proclaims hard truths over Shaun Ringsmuth’s pounding, pulsing rhythms, it’s the absolute opposite – it’s as if someone’s forcing your eyes wide open, Clockwork Orange-style, to stare at the ugliest and harshest realities this world has to offer. Founded by Icelandic composer and sound designer Elvar Geir Sævarsson in order to perform his contemplative yet titanic score for Fjalla-Eyvindur & Halla – a production by The National Theater – GLERAKUR (Icelandic for ‘Glass Field’) is currently one of the most important cornerstones of the country’s thriving music scene. GLERAKUR’s debut album, The Mountains Are Beautiful Now – the soundtrack to the aforementioned play – is very impressive, and won Iceland’s prestigious Kraumur Award in 2017. Though the band’s cinematic take on Godspeed You! Black Emperor and Swans really comes to life over a full set, as we experienced at last year’s Eistnaflug. With two drummers, and four guitarists, GLERAKUR multiplied their hypnotic waves of dreamlike-atmospheres and harmonic feedback into such an overwhelming and mesmerising performance that we simply had to invite them for the 2019 festival. Melissa Guion will be at Roadburn performing as part of the Thou Artist In Residence extravaganza, which we are already breathlessly anticipating. However, we’re thrilled to announce that she will also be performing her own set – aided and abetted by live collaborators – under the moniker, MJ GUIDER. If you’re unfamiliar with the hypnotic fayre of her 2016 release, Precious Systems, then the good news is that there’s just about 11 weeks before Roadburn to get yourself up to speed. Immerse yourself in the swirling landscapes and enchanting melodies on offer; lay back in the stream of lush instrumentation and let it wash over you. MJ GUIDERs output is a multilayered offering, and yet remains delicately sparse at times. Never the most prolific of bands, nor the most well-known, nevertheless L’ACÉPHALE have offered some of the most intelligent blackened folk music throughout the years. While this decade has only witnessed a few small releases – after Malefeasance and Stahlhartes Gehäuse, their only full-lengths, punctuated an unusually productive period in 2008 and 2009 – they have all been remarkable, and once we were made aware that the band was getting ready to become more active, we saw the perfect opportunity to satiate our hunger for more L’ACÉPHALE. With the announcement of their self titled, 74-minute album coming this April on Eisenwald, what better time to explore the abyss than now? 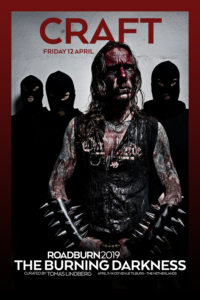 As well as participating in the Maalstroom commissioned performance, GREY AURA, hailing from Utrecht, The Netherlands, will also bring their conceptual Black Metal to Roadburn 2019 on Sunday, April 14. GREY AURA are using their playful yet sometimes schizophrenic take on this genre (like some of the others participating in Maalstroom) as a vehicle to expose and explore the darker side of the mind. With a new home (the 013’s Green Room) and a new name, Roadburn’s pre-show party, Ignition, is primed and ready to get the festivities off to a killer start. 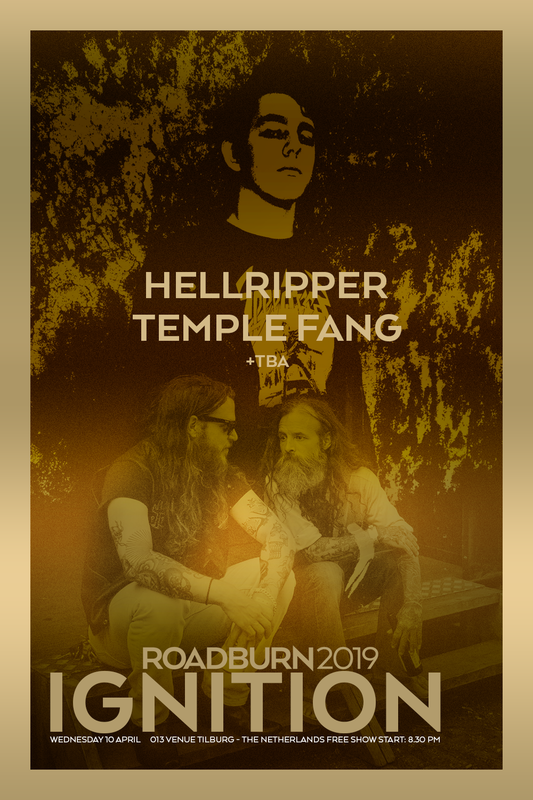 Featuring TEMPLE FANG and HELLRIPPER – a third band will be announced in due course – Ignition is the perfect way to kick off your Roadburn on Wednesday, April 10 – and sticking with tradition, it will be free to attend. Though there’s no release yet, TEMPLE FANG – featuring of Death Alley alumni, Dennis Duijnhouwer and Jevin de Groot – are currently making quite a name in the Dutch underground by way of hypnotic and overwhelming live shows. Channeling the spirit of Grateful Dead, Hawkwind, Blue Öyster Cult and Captain Beyond, some fuzzed-out rawk comes to the forefront of their sound as well! While TEMPLE FANG will bring the psych and expand your mind and your senses, HELLRIPPER will be the perfect antidote for all that! If anything, the Scottish kings of old-school dirty black/speed nastiness will contract your mind into a tiny and super dense ball of steel! Formed in 2014 by backwards visionary James McBain under the spiritual guidance of Venom, Sabbat or Kreator, they’ve since expanded into a full live band and are now ready to tear our head off while thrashing like maniacs. 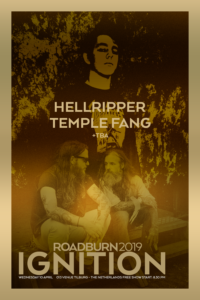 Roadburn Festival 2019 is SOLD OUT. Accommodation options remain in Tilburg and further afield – please check the website for more details. There goes another 0.222 seconds.